My New Year’s resolution is to shed some pounds without stressing over it. I love to snack and I tend to snack on candy and carbs. It’s almost impossible that I will steer away from snacking so instead I’m trying to substitute healthy snacks for the junk food. I bought a wrap to snack on and it was so delicious. It’s almost like a sushi roll without the nori and rice. 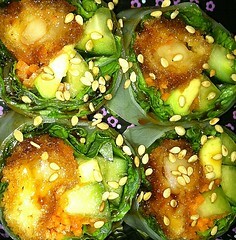 It had shrimp tempura, lettuce, carrots, cucumber and avocado wrapped in rice paper. I used a sweet chili dipping sauce.